Mix together the fennel, sage, olive oil, lemon juice, salt and pepper; rub all over the pork chops. Heat the olive oil in a large pan, brown the chops on both sides and cook until done (about 5–7 minutes. Remove from pan, add tomatoes, pour over wine and cream, bring mixture to the boil and simmer for 3–4 minutes. Return chops to pan to heat through. Place a pot of water on the stove, add beans and bring to the boil, cook for 5–7 minutes or until tender; drain beans, toss with orange, pecans and mint; drizzle with olive oil and season. 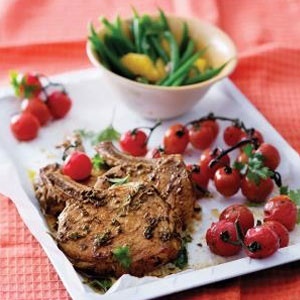 To serve: Place the pork chops on a plate, top with pan juices and vine tomatoes, serve with green beans.